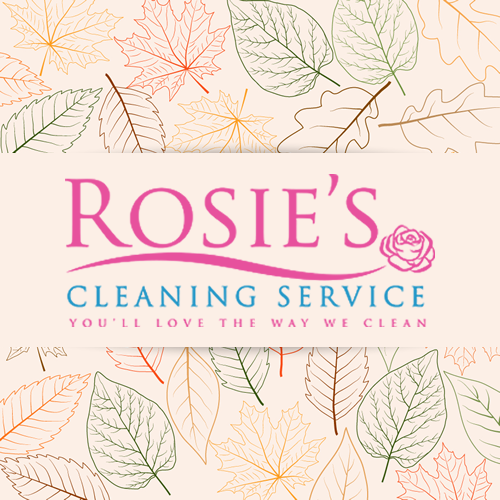 We’re very excited to usher in the Fall Season here at Rosie’s Cleaning Service. The Fall season brings cooler weather, colorful falling leaves, and a sense of urgency for us to start preparing to hunker down for the upcoming colder days of winter as our internal seasonal timers are set to fall. Let Rosie’s Cleaning Service help you prepare for fall. Not sure where to begin with your fall cleaning? No worries. Take a look at these fall cleaning items that you may want to add to your Fall Cleaning Checklist. Windows: Wash windows to remove left over summertime debris and dust that may be left over from falling leaves brushing up against your home or office windows. Appliances: To keep your appliances running and in tip-top shape be sure to dust off any exposed parts of your small and large appliances. Refrigerators are a heavily used appliance, dust your condenser coils to assure a smooth operating experience. Carpets and Rugs: Thoroughly vacuum and or shake carpets and rugs to remove left over summer debris like beach sand and leftover dirt from mud pies. Smoke Detectors and Carbon Monoxide Detectors: Take the time to make sure that these items are in good working condition, dust free, and have good batteries for safety. No time to take care of the items on your Fall Cleaning Checklist on your own? Contact Rosie’s Cleaning Service today and request your free cleaning quote. We can help you take care of the tasks listed on your fall cleaning checklist in order to have your home shining like a brand new penny inside and out as we welcome the arrival our old friend: Fall. We offer dependable, trustworthy, affordable, and reliable home and office cleaning in the Santa Barbara and surrounding areas. Rosie’s Cleaning Service has been offering superior cleaning services in the Santa Barbara, Goleta, Santa Ynez and surrounding areas since 1990. We’re also licensed, bonded, and insured which allows for us to consistently maintain our A+ Rating with the Better Business Bureau. Here are some events coming up in our community that may be of interest to you and your family. Dia de los Muertos Tour: Celebrate Dia de los Muertos on Friday November 3rd from 8 to 9 pm at UCSB in Campbell Hall Building 538. Enjoy the exciting and diverse sounds of Mexican music as three of today’s hottest alt-Latino groups, La Santa Cecilia, Mexrrissey and Mariachi Flor de Toloache, come together for the first time. Through The Looking Glass: Nebula Dance Labs is having a special, one night only performance of “Through The Looking Glass”. This performance will take place at the Lobero Theatre (33 East Canon Perdidio Street in Santa Barbara) on Wednesday November 1st from 8 to 10 pm. Watch as the curious, imaginative world of Alice comes to life in this compelling new work inspired by Lewis Carroll’s book. Sketching In The Galleries: Head on down to the Santa Barbara Museum of Art (1130 State Street) on Thursday November 16th from 5:30 to 6:30 pm to participate in the tradition of sketching from original works of art. This month you will be sketching from the exhibit entitled “Valeska Soares: Any Moment Now”. All skill levels are encouraged to come, and Museum Teaching Artists will provide some guidance and all the necessary materials. Chowder Fest: Santa Barbara’s Chowder Fest is back on November 5th from 1 to 4 pm at Fess Parker’s DoubleTree Resort in Santa Barbara. Chowder Fest is a chowder competition, food festival, wine and beer tasting all rolled up into one event, and for the first time, this year there will also be a chili competition! Come enjoy fresh chowders and chilis as Santa Barbara eateries compete for the title of Santa Barbara Chowder Champion and People’s Choice awards. Local favorites Tom Ball and Kenny Sultan will be playing live music. Voodoo Lounge Halloween Dance Party: 10-28-2017 – This wicked dance party is put on annually with proceeds benefiting benefiting a local Teddy Bear Cancer charity. With entertainment like DJ Scott Topper, Haunted Action Photo Booth, costume contests, Instagram contests, & the Voodoo Altar this will be a haunting evening to remember! Give us a call today at: (805) 698-3132 to request a free cleaning quote or to make an appointment for services. Partnering with a trusted Santa Barbara maid service can really help to stay on top of work-life balance. It’s great that aside from the regular cleaning plan, Rosie’s is also offering customized cleaning solutions. It’s always difficult to clean carpets and rugs, which is why I always entrust this task to a Santa Barbara cleaning company. This saves time and energy, and I find Rosie’s Cleaning Service most efficient for this job.